While PUBG Mobile is a huge hit, the battle royale game is also one of the most popular games around the globe when it comes to PC gaming. A new update for the PC version is on its way as the company has confirmed new features and additions on its test servers. The full change-log for update #25 is out and confirms quite a few things. Expect new vehicles, weapons, weather systems, loot rebalance, along with a bunch of bug fixes. While the update has only rolled out to test servers, we can expect the new features hitting public servers soon enough. After the snowmobile PUBG is adding a new vehicle to suit the snowy terrain. Vikendi will be getting a new snowbike that offers extra mobility and speed. Since it is not going to be as well built as the snowmobile, chances are that it can be destroyed rather quickly. There’s also a new Bizon SMG which will be added to the roster of weapons. It uses 9mm ammo, can hold 53 rounds as default, and you can attach muzzle and sight attachments. It will only be available on Vikendi and Erangel. Along with the new gun, there is also a new Canted Sight attachment. This allows players to equip two sights at once. The Canted Sight can be added to weapons with a secondary scope slot. This should help in quickly changing your scope to suit the style of battle. As for weather, PUBG is adding a new weather setting to Vikendi called Moonlight. 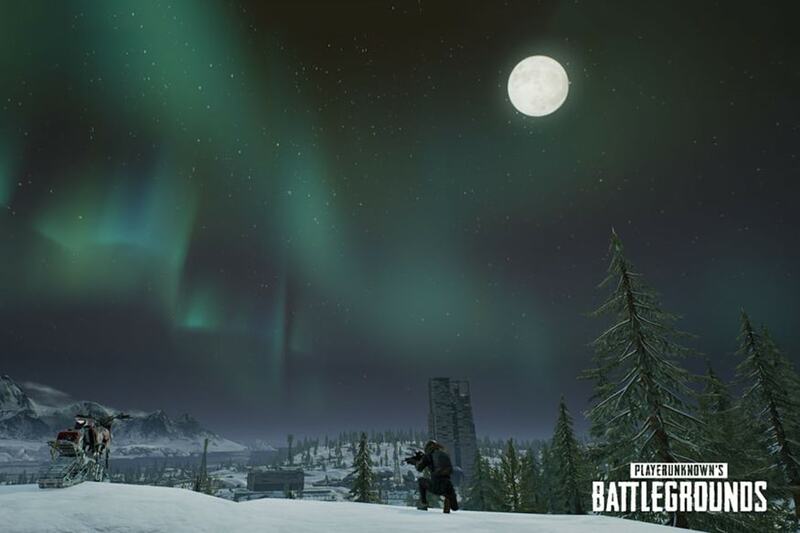 The mode enables you play under the lights of a super moon and aurora borealis making it a wonderful sight while you grab a chicken dinner. There are a bunch of more features and updates that are in the pipeline so make sure you go through the complete change-log.